The First World War officially ended on 11th November 1918. On this day the Germans surrendered, and signed an ARMISTICE with the Allies (represented by Britain, France and USA). An armistice is an agreement to stop fighting and wait for a PEACE TREATY (a legal agreement to end a war) to be drawn up. The Treaty of Versailles became the model for the four other treaties with the defeated nations. Each treaty is named after a different place in Paris. When the Germans signed the armistice, they believed that the peace treaty which would follow would be based on Woodrow Wilson’s 14 Points. Wilson was the President of the USA, and his 14 Points were designed to treat Germany in a fair and democratic way. However, the other two Allied leaders, George Clemenceau of France, and David Lloyd George of Britain, had other ideas. Clemenceau of France wanted Germany punished severely for her crimes, and made so weak that she could never make war again. Lloyd George was fearful however that a harsh treaty could lead to another war in future. The British public disagreed. They felt the same as Clemenceau, that Germany should be punished harshly for the damage that she had caused during war. In the end Lloyd George bowed to public opinion and agreed with many of the demands of France (although in some cases, such as reparations, in a watered down form). Wilson’s 14 Points were not put into practice, and Germany was forced to agree to the terms of a treaty, the Treaty of Versailles, drawn up by the Allies. On 28th June 1919, German government officials were forced to sign the Treaty of Versailles. If they refused then Germany would face invasion. It was signed in the Palace of Versailles, near Paris. The German government did not want to sign the treaty because it was so harsh. They hated the fact that they had had no say in the Treaty negotiations, so they called it the DIKTAT, the ‘dictated peace’. When the German public got to hear about the treaty they simply could not believe that their government had signed it. The public didn’t understand, or could not believe, that the new government had no say during the negotiations. They felt the government had let them down badly, so many Germans referred to it as ‘THE STAB IN THE BACK’. The government had ended the war and given in to ally demands without a fight – surely the German Army could have fought on and eventually won the war! It was felt that the treaty dishonored the soldiers and that the government had betrayed the people of Germany. In truth, many Germans never forgave the Weimar government for signing the treaty, and often referred to Weimar politicians as ‘THE NOVEMBER CRIMINALS’. Why did the Germans hate the Treaty of Versailles so much? This is important to understand, because the way that the Germans reacted to the signing of the Treaty was a major factor in Hitler’s rise to power. In order to understand why the Germans hated the Treaty so much, we need to take a closer look at what some of the clauses within the treaty said. Germany had to accept total responsibility for starting the war. This was called the ‘War Guilt Clause’, or Article 231. Germany had to pay £6,600 million to the Allies to cover the damage it had caused during the war. This was a form of compensation known as reparations. Germany had to hand over 70,000 square kilometres of land to the Allies. The allies shared this land out amongst countries within Europe. For example, Alsace-Lorraine was returned to France (the Germans had taken it off France in 1871), West Prussia and Posen were given to Poland, and Eupen and Malmedy were given to Belgium. This was supposed to make Germany weaker, and make other European countries stronger. 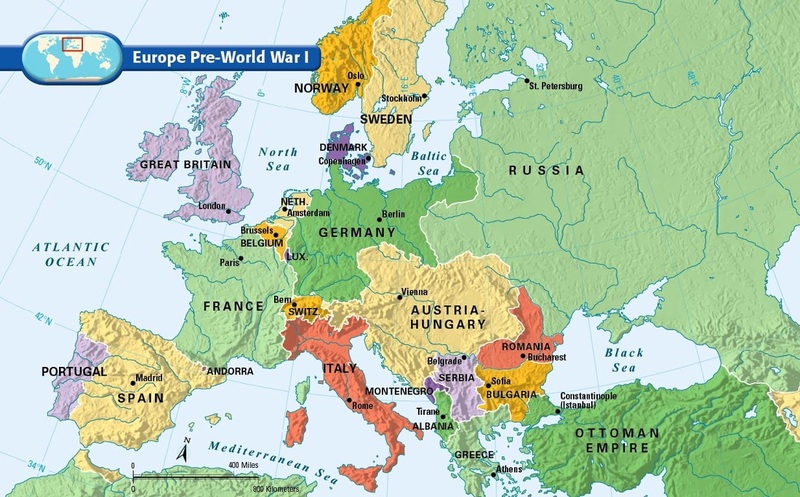 This would help to prevent Germany invading its neighbours within Europe in future years. Germany had to hand over all its colonies to the Allies. Colonies are areas of land that are governed by a Parent State although they are outside of that state – they are abroad. 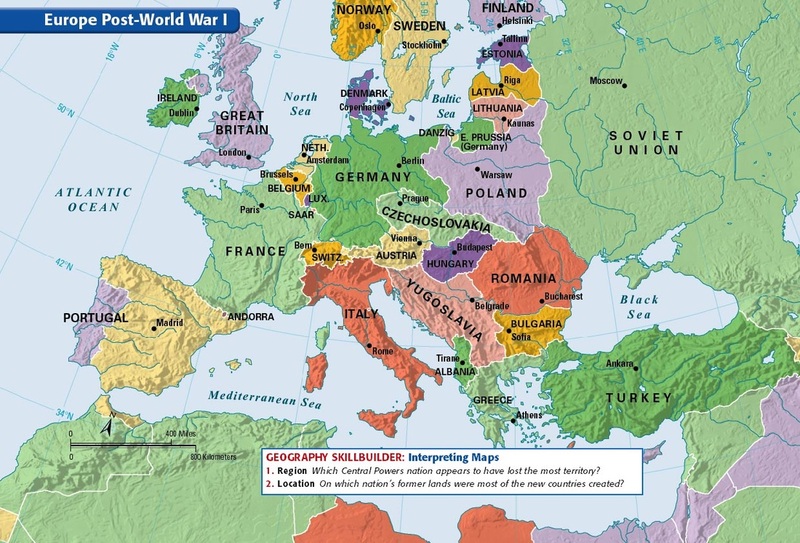 Germany’s colonial Empire amounted to about one million square miles. One of the largest areas to be taken from Germany was in Africa. The Union of South Africa administered German South-West Africa. Britain, France and Belgium divided up the rest of the African land governed by Germany. The German armed forces were to be reduced greatly. The Reichwehr (Army) were only allowed 100,000 men, and were not allowed to use conscription (forcing ordinary men to join the army for a period of time). The Navy was limited to 15,000 sailors. The use and production of weaponry was limited. The Germans were not allowed an airforce or any submarines. The Navy was only allowed six battleships and the buying of any further war materials was banned. The Rhineland had to be occupied by Allied troops. This area bordered France and was meant to give the French greater security. The occupation was to last for fifteen years and no German troops were to be allowed into the area. How/why does all of this lead to World War II?